Is 18.4-inches too big for a tablet? As dockable tablets become more popular companies are getting more creative with their multi-purpose devices, such as the new tablet-desktop hybrid Asus debuted at CES. Asus has unveiled the Transformer AiO, an all-in-one PC with an 18.4-inch detachable display that can function as a separate tablet. As a PC, the Transformer AiO will run on Windows 8 and feature a 3rd generation Intel Core processor and an NVIDIA GT 730M GPU. The 18.4-inch display can then be removed from the desktop base and carried around like an over-sized tablet. In tablet mode, the display can function as a remote desktop, wirelessly controlling Windows 8 on the desktop base. With the press of a button it can also turn into a full Android tablet, running Android 4.1 Jelly Bean with a Tegra 3 quad-core CPU. While tablet-notebook hybrids are increasingly common, the Asus Transformer AiO is the first attempt to merge a tablet with a desktop computer. With an 18.7-inch display, the Transformer AiO will be the largest tablet on the market, complete with a built-in kickstand and a briefcase-like handle to make it easier to carry. The question remains who will want to carry it, as the Transformer AiO is targeting a unique set of users interested in both a massive tablet and a small desktop PC. 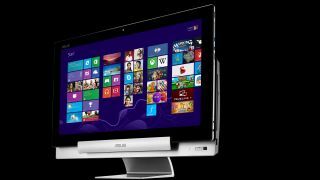 There are no price details at this time, but Asus is targeting a launch some time in 2013's first quarter, so the company should have more to say about the Transformer AiO soon.